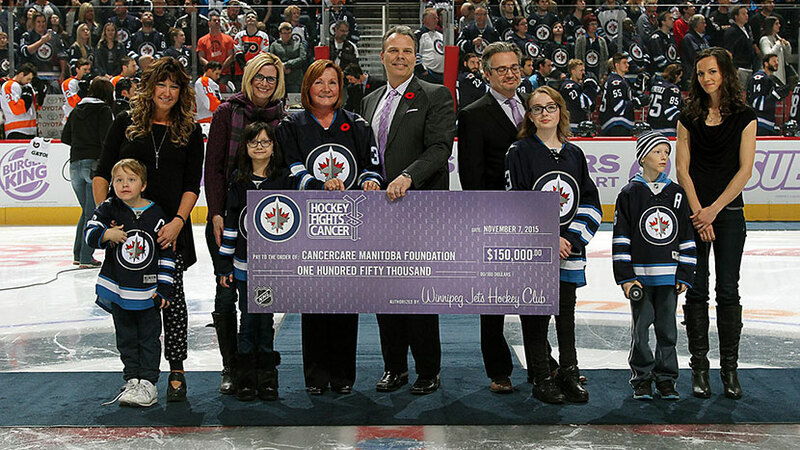 The Winnipeg Jets Hockey Club, in conjunction with the National Hockey League, announced the organization’s efforts for the league-wide initiative Hockey Fights Cancer. The Jets will host Hockey Fights Cancer night at MTS Centre when they take on the Chicago Blackhawks on Wednesday, Nov. 15, 2016. Game time is 7:00 p.m. CT.
That night, all Winnipeg Jets players will wear special Hockey Fights Cancer jerseys during pre-game warm up. During the game, Jets coaches and broadcasters will wear official lavender-coloured Hockey Fights Cancer ties. The Winnipeg Jets will also convert all their rinkboards and in-game visual media to lavender on Nov. 15 in order to generate increased awareness for the cause. Raffle tickets will be sold for $5.00 at all Jets Gear locations and in the concourse at eleven Winnipeg Jets home games between Monday, October 3rd and Wednesday, November 15th, for a chance to win warm up issued Hockey Fights Cancer jerseys. After the game, there will be an online auction featuring special Hockey Fights Cancer painted goalie masks worn by Ondrej Pavelec, Michael Hutchinson, Connor Hellybuyck, and Eric Comrie. Jets fans will also be able to bid on player worn Hockey Fights Cancer ties, game-used lavender-taped sticks and warm up worn jerseys through the online auction. All Jets Gear locations (MTS Centre, Kildonan Place, Polo Park, St. Vital and MTS Iceplex) will sell a variety of limited edition merchandise, with a portion of the proceeds going to Hockey Fights Cancer. Finally, Peller Estates will donate a portion of proceeds from each purchase of their Proprietors Reserve wine sold in Manitoba Liquor Marts. Details of the auction time frame and all information regarding these and other Hockey Fights Cancer initiates can be found at www.winnipegjets.com/hockeyfightscancer. All proceeds raised will be directed to CancerCare Manitoba’s pediatric clinical trials. Currently the Foundation funds over 50 percent of the cost of clinical trials for children and teens with cancer here in Manitoba. Manitoba continues to have the highest participation rate of pediatric trials in the country. This has been in large part because of the significant donations CancerCare Manitoba Foundation directs to this effort year after year – all funds raised by CancerCare Manitoba Foundation stays in our province to benefit Manitobans with cancer and their families. This Thursday, the puck drops on the Winnipeg Jets’ season at MTS Centre for the first game of the 2016-17 season against the visiting Carolina Hurricanes at 7:00 p.m. CT. Fans should get to the game early as 15,000 glow wands will be handed out prior to the game, while 15,000 fridge magnets will be distributed following the contest. Full team introductions will take place prior to the game along with a tribute to long-time fan Len “Kroppy” Kropioski. The Jets will also introduce their new introduction video featuring the music of Winnipegger Shawn Pierce as performed by the Winnipeg Symphony Orchestra.